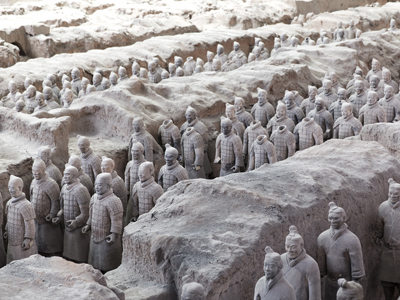 The first half of this itinerary is a tour through China's more under-traveled destinations. With the tourism boom occurring in China, it's truly a special experience to find beautiful places with few tourists. Lijiang is a perfect example. In any other country, a medieval-era city complete with stone streets and centuries-old buildings would be an attraction. Yet today, it remains just enough off the beaten path to offer travelers a truly authentic experience. This itinerary features these places, both in city- and countryside-form. The second half is a highlights tour of China's more popular destinations, Shanghai, Xian and Beijing. 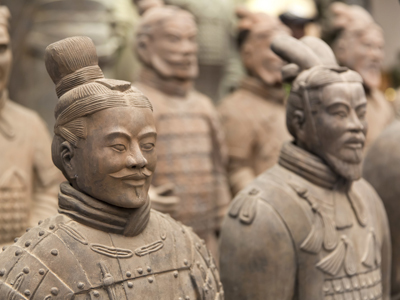 The classic sites are all here: the heart of modern China in Shanghai, the Forbidden City and Great Wall in Beijing, and the Terracotta Warriors near Xian. This itinerary is a fantastic introduction to China, offering different perspectives on this country deep in culture and history. Today you will be met at your hotel to embark on a tour of the Yuantong Temple and the Stone Forest. Enjoy lunch at the Stone Forest Hotel. Yuantong temple, with a history spanning 1200 years, is the largest temple in Kunming. In 1956, the grand ceremony of greeting and consecrating the Buddha's tooth was held here - making it a greatly important landmark. With so many international travelers spreading across every Chinese nook and cranny, it's difficult to find a city that hasn't completely succumbed to the tourism hype. 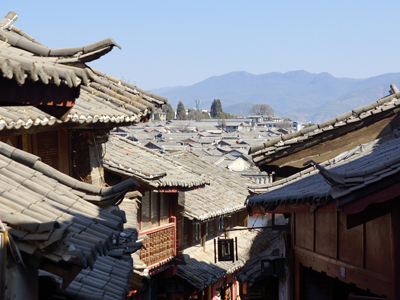 Sandwiched between a pair of popular Yunnan province destinations, Dali remains relatively unexploited. An authentic Chinese lifestyle can be found here, centered around the best parts of travel: eats, drinks, and fun. Most souvenir-hawking is confined to the appropriately named "Foreigner Street" in the Ancient City, while the rest of the city maintains a proud and modern attitude toward its history. The ancient city of Dali is 13 kilometers away from Xiaguan, at the foot of Cangshan Mountain. It was built in the year Hongwu 15 of the Ming Dynasty, or 1382 AD. It ranks first on the list of famous historic and cultural cities of China. Here, clear springs, traditional houses, and local people growing flowers and living simply, you get a true glimpse of quotidian life in the countryside. Afterwards it’s on to your next tour. The Houses of Bai people in Xizhou are located in the Xizhou Town which is 16 kilometers away from the Ancient City of Dali. 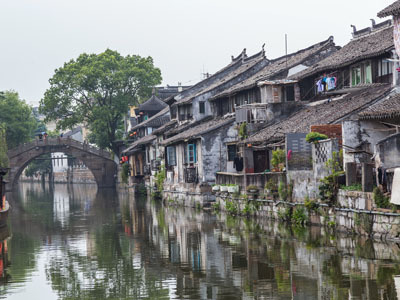 Xizhou is not only a famous historic city, but also a typical commercial town of Bai people. 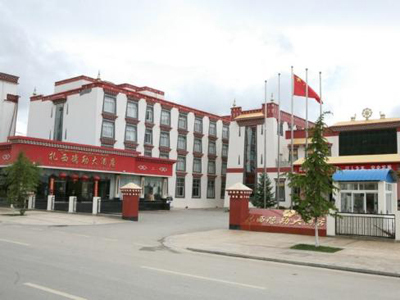 It is one of the cradles of National capitalism of Bai people, and a famous hometown to overseas Chinese in Yunnan. You will see typical Bai traditions and dresses there. Some buildings are old and typical ancient architectures, which are the real local house. On the outside walls of each house, there are numerous exquisite paintings showing the art atmosphere. The area around Lake Erhai is blessed with a mild climate and fertile land with forests containing valuable stocks of timber, medicinal herbs and rare animals. A horse-drawn carriage ride on the shores of the lake is an excellent way to discover this beautiful area. Then visit Black Dragon pool, a famous pond in the scenic Jade Spring Park. Featuring several small temples and pavilions such as the Longshen Temple and Moon Pavilion, soak up the gorgeous views. 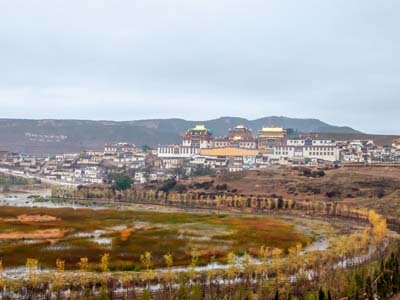 Traveling north to south, Shangri-La is the first city where one really feels the Tibetan influence on Chinese culture, or the Chinese influence on Tibetan culture. The Tibetan monastery is why many people come here, and many more come here to begin the journey across Tibet. Locals are both used to foreign travelers and thankful for them. Expect a warmer-than-average welcome to the city. Shangri-La serves as the legendary jumping-off point into the Himalayas. Speaking of Himalayas, make sure to take your time here. At 10,500 feet above sea level, you may have to stop for a breath or two while climbing the steps of this city. View the first bend of the Yangtze River at The Stone Drum Town. Stone Drum Town stands at the base of the mountain flanking First Bay on the Yangtze River. This town derives its name from a white marble carved monument in the shape of a drum. It has a diameter of 15 m and is 0.7 m tall. This historically relevant stone monument was erected during one of the earliest periods of history of the Lijiang area. Today's adventure in Shangri La entails a visit to the Songzanlin Lamasery and the Pudacuo National Park. You can look forward to enjoying lunch along the way at Arro Khampa. Songzanlin Lamasery is the largest Tibetan Buddhist lamasery in the entire Yunnan Province. Occupying an area of 33.3 hectares, it was built in the style of Potala Palace in Lhasa and represents the Tibetan culture. On property, it houses many buddhist statues and several precious cultural treasures. Located near Shangri-La in China's Yunnan Province in southwest China, the Pudacuo National Park covers a total area of nearly 2,000 square kilometers. This park has an average altitude of 3,500 meters and retains a well-preserved ecosystem within the virgin forests. The must-see scenery in this park includes Lake Bita and Lake Shudu. "Bita", means "a place with a dense oak forest", in the Tibetan language and "Bitahai", means "a quiet lake". The Bitahai Lake is surrounded by mountains covered with ancient pines, oaks and rhododendrons, and therefore appears like an emerald in the heart of the mountain. Shudu Lake is located in the northeast of Shangri-la and it is one of the largest fresh water lakes on the Diqing plateau. The lake is surrounded entirely by a forest of fir, spruce and silver birch, and is home to many wild animals such as bears, golden cats, deer and pheasants. As China opened its doors to the international community in the second half of the 20th century, Guilin was the crown jewel. The epic landscapes, combined with the charming historic town, created a picturesque vision of rural China - and does so to this day. 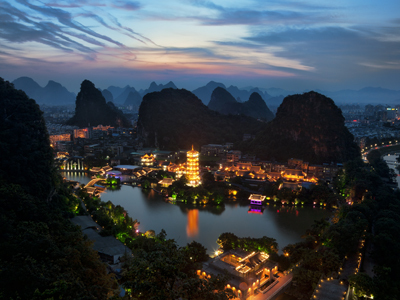 Guilin serves as a central base for travel in the region around it. International hotels, restaurants, and shops line the streets of the historic center to accommodate the tourism economy. One is sure to meet international travelers who will inevitably share stories of their adventures around town. Guilin is the perfect place for new travel stories to be born. Alongside your guide today, you will embark on visits to the Elephant Trunk Hill, Reed Flute Cave and Daxu Ancient Town. Enjoy lunch at McFound Restaurant during the excursion. Elephant Trunk Hill is located at the junction of Li River and Peach Blossom River. It is the symbol of Guilin with 55 meters high and got its name because its shape resembles an elephant with its trunk drinking from the Li River. The hill is pierced with many caves and topped with a small pagoda. Located 5 kilometers northwest of Guilin city, the Reed Flute Cave gets the name from the reeds used for making flutes and pipes that grow at its entrance. 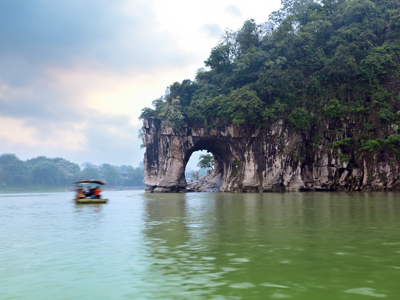 The cave is regarded as the largest and most impressive cave in Guilin. It is 240 meters long, and the length of the tour is about 550 meters offering a magic land of stalactites, stalagmites, stone pillars, stone curtains, birds, plants and animals in fantastic shapes and colors. The visit lasts for 40 minutes and there are a lot of steps. Watch your step as the lights are dim. Your guide will show you by electric torch. Today, you will make a day trip to Longsheng with your private guide and driver to enjoy visits to a minority village and the incredible terraced fields. Lunch will be served at Ping'an Restaurant along the way. 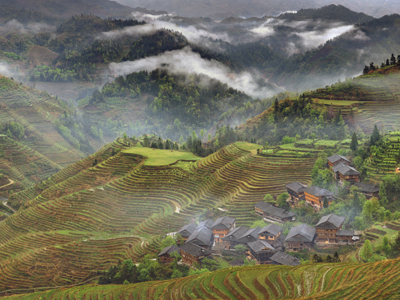 The Longji Terraces are built into the steep mountain range named "The Dragon's Backbone", about 2.5 hours from Guilin. The terraces look like ribbons, as they wind from the foot, all the way up to the top of the mountain. This ingenious construction makes the best use of the scarce arable land and water resources in the mountainous area. There are about 66 square kilometers of terraced fields in the district. The Terraces were first built in the Yuan dynasty and completed in the Qing dynasty by the Zhuang people. Today, you will embark on a scenic Li River cruise from Guilin to Yanghuo. A cruise along the Li River between Guilin and Yangshuo is an unforgettable experience. As you take in the picturesque views that surround you, you can spot something interesting to admire at almost every bend in the river. 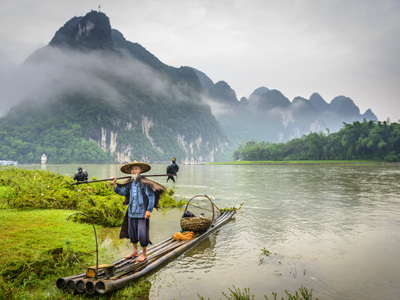 Between spectacular limestone peaks, you will see graceful bamboo groves, farmers tending rice paddies, and lumbering water buffaloes pulling carts or cooling off in the river. You might even witness fishermen gliding along on their narrow bamboo rafts, and if you're very lucky, one of the famous fishing cormorants. The medium sized river cruise boats depart from various wharves, according to the height of the river at different times of the year. Travelers don't visit Yangshuo for the city, they visit for the countryside that's just a short drive away. 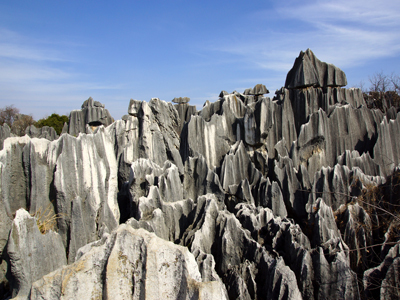 The karst rock formations that make up the surrounding landscapes are almost out of a dream. Hiking, biking and river boating one's way through the maze of mountains is really all the reason you need to visit this place. Yangshuo itself is friendly towards visitors, with plenty of English speakers and international restaurants throughout. Today, you will go on a full day and comprehensive tour of Shanghai, beginning at Yuyuan Garden located in the center of the city's old quarter. This was a private garden built in 1559 during the Ming Dynasty, with typical Chinese classic architecture and style. The garden is surrounded by a busy market place selling everything from local snacks, to handicrafts and antiques. Next you will visit the Bund. This 1.5-kilometer-long embankment runs along the western bank of Huangpu River. On its west side it is the "architecture gallery" with 52 well-preserved old European style buildings. 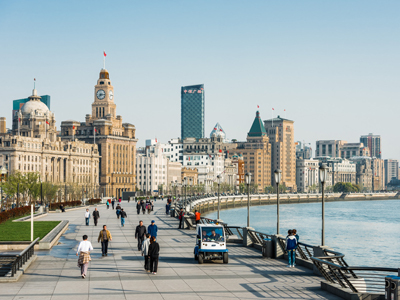 Once the major trading and commercial center of old Shanghai, the Bund has now taken on new vitality, with futuristic developments, chic restaurants, top end shops and bars offer plenty to see and do-and by night it's magic! 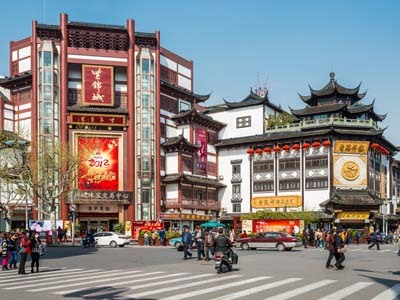 Following the Bund, you will head to Jade Buddha Temple. Built in 1918, Jade Buddha Temple is a very popular Buddhist temple among local people. The main treasures are two statues of Buddha imported from Burma by sea. They were carved from rare single blocks of white jade adorned with precious stones. The temple is a hive of activities with monks, worshippers and visitors. Afterwards, continue on to the Ancient City Wall - one of the oldest and most complete city defense systems still in existence. 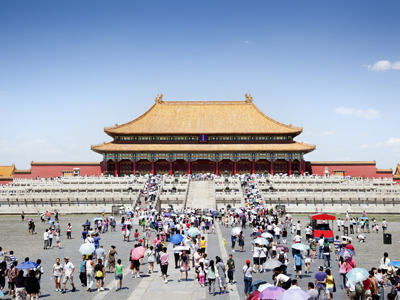 Built in the 13th century on the foundations of the original Tang Forbidden City, it surrounds the city center. Next, head to the Muslim quarter to take a stroll down the avenue. Paved with bluestones and dotted with unique stalls, souvenir shops, cafes and bars special to this area. Today's excursion will lead you to the Big Wild Goose Pagoda. A major Buddhist site, this simple, elegant brick Pagoda stands in the grounds of the attractive Da Ci'en Temple. The Pagoda was built in the 7th century to house the Buddhist materials that Xuanzang (Tripitaka) brought back from his epic journey to India. The Temple complex has several large halls with some great Buddhist statues and murals. Lunch will be served today at the Wa Shan Zhai Restaurant. 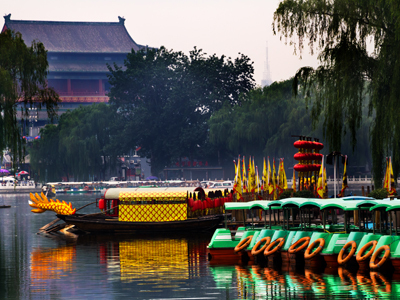 Before your overnight train to Xian this evening you will enjoy some more sightseeing in Beijing. Begin with a visit to the Summer Palace. 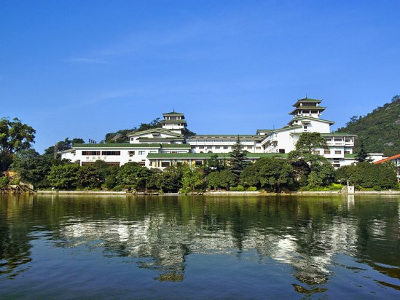 Located in the northwest area of Beijing, the Summer Palace is the largest and best-preserved royal park in China. 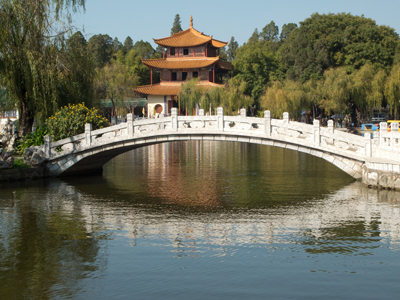 Exemplifying Chinese horticulture and landscaping, this place has long been recognized as "The Museum of Royal Gardens". Walk for about 2 hours to soak in the sights and views. 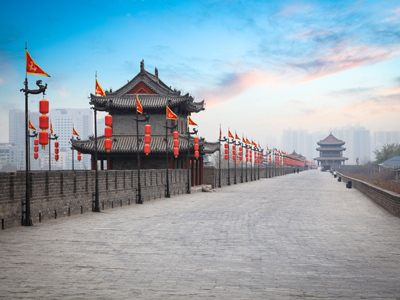 Today you will visit two of China's most impressive engineering feats, one old and one new! 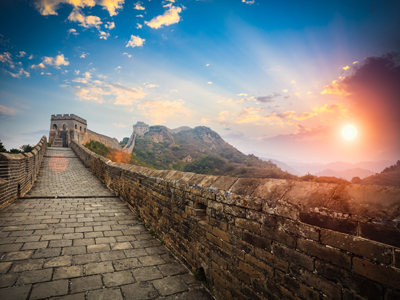 After breakfast, your guide will accompany you to the Mutianyu section of the Great Wall. This less-crowded section of the Great Wall is about a 2.5 hours' drive from downtown Beijing. A cable car takes you to a good section (avoiding a very steep climb), where you can walk along the wall, through the watch towers and enjoy superb views as it snakes across the hills and mountains. You can return by cable car, walk down or walk along the wall for about an hour to descend by chairlift. You will also visit the Temple of Heaven today. Built in 1420 during the Ming Dynasty, Temple of Heaven is a complex of Taoist buildings where emperors of Ming and Qing dynasties visited for annual ceremonies of pray for good harvests. Located in the south of Central Beijing, it covers an area of 273 hectares. Temple of Heaven was enrolled as a World Heritage Site by UNESCO in 1998. Next you'll visit the Temple of Heaven. Built in 1420 during the Ming Dynasty, this complex of Taoist buildings was a place where emperors visited for annual ceremonies to pray for good harvests. 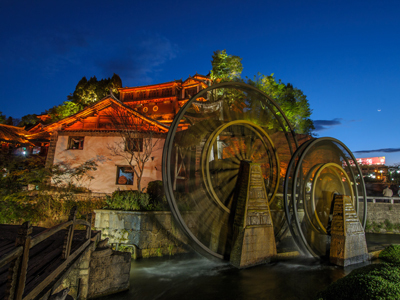 Opened in 2002, the Dali Landscape Hotel is located in the famous Old Town of Dali, Yunnan Province. This hotel is built in traditional Bai Nationality style. It is 13km away from the City Center, 15km away from the Railway Station and 25km away from the Dali Airport. The Dali Landscape Hotel offers a total of 315 guest rooms, including standard room and single room, etc. All rooms are provided with IDD/DDD phone and 24-hour hot water and so on. The Chinese restaurant in the hotel mainly provides local specialty foods. 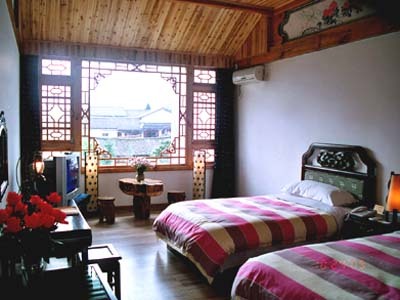 Located in Lijiang Old Town, Lijiang Ivy Garden Resort Hotel features traditional Naxi architecture and décor. It offers a restaurant and an outdoor courtyard. Get the celebrity treatment with world-class service at Lijiang Ivy Garden Resort Hotel. The luxurious rooms at Lijiang Ivy Garden Resort Hotel come with Naxi furnishings and are well-equipped with a mini-bar and a flat-screen TV. A bathtub and hot shower facilities are available in the private bathroom attached. Situated within the vicinity of Ganden Sumtseling Monastery, this property is a short distance away from Diqing Museum and Guishan Park for your benefit. Equipped with a restaurant on site, game room, concierge access and complimentary wifi throughout the property, you are sure to stay occupied and comfortable during your stay. The Guilin Park Hotel (Guilin Guihu Fandian) is located near Laoren Hill, by the banks of scenic Gui Lake, with easy access to Solitary Beauty Peak and Diecai Hill. The main villa blends Chinese traditional architecture with a contemporary style. Guests can choose from variously sized rooms which range from standard rooms to deluxe suites. There are also rooms available for special-needs guests. Dining options at the four on-site dining outlets offer Chinese and Western cuisines. 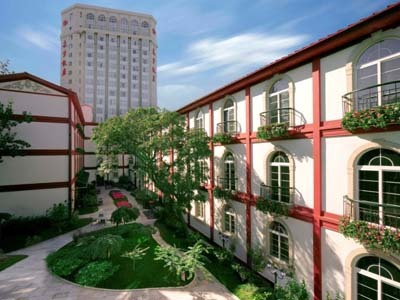 Business travelers can employ this Guilin hotel's various conference rooms and multifunctional halls. Guests looking to stay fit and energized can workout in the fitness center or swim in the pool, while those in need of a little pampering can visit the beauty salon. The hotel also offers travel information and currency exchange services. 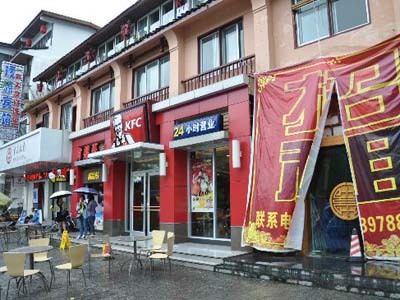 Renovated in 2008, the Ai Yuan Hotel guarantees guests a pleasant stay whether in Yangshuo for business or pleasure. Only 0.1 km from the city center, the hotel's strategic location ensures that guests can quickly and easily reach many local points of interest. 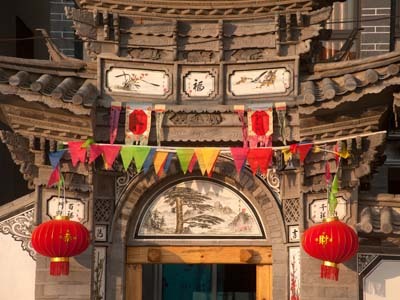 Visitors to the hotel can take pleasure in touring the city's top attractions: Fuli Ancient Town, West Street, Impression Sanjie Liu. 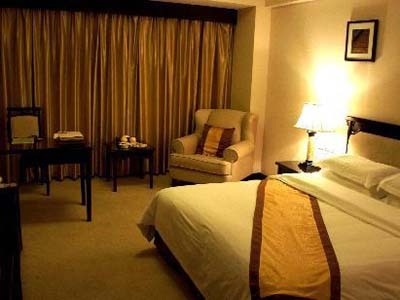 The facilities and services provided by Ai Yuan Hotel ensure a pleasant stay for guests. Top features of the hotel include 24hr room service, coffee shop, shops, car park, meeting facilities. The hotel features 72 beautifully appointed guest rooms, each including desk, internet access – LAN, hair dryer, satellite/cable TV, television. The hotel offers fantastic facilities, including garden, to help you unwind after an action-packed day in the city. Ai Yuan Hotel is your one-stop destination for quality hotel accommodations in Yangshuo. 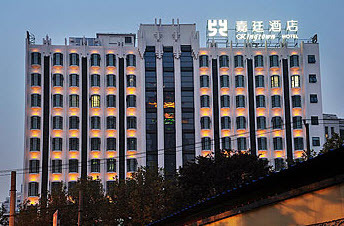 The Kingtown Hotel Plaza Shanghai has an extremely convenient and central location, in the heart of Shanghai's business, entertainment and shopping center. It offers clean and compact rooms, with easy access to Metro Lines 1, 2 and 8. Nanjing Road Pedestrian Mall, Huaihai Road shopping district and the People's Square are all close at hand. With the Metro, the whole city is at your disposal (and taxis to get around in your free time are inexpensive and plentiful). Rooms and suites in this Shanghai hotel are all outfitted with LCD PC-TV equipment, and a wireless network covers the entire hotel. On-site Chinese, Western restaurants and a café serve fine food. 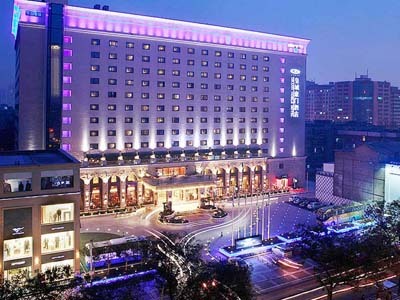 East meets West at Dong Fang Hotel Beijing, a 25-minute drive from Tiananmen Square and the Forbidden City. The hotel combines classic Chinese and Western design and offers 2 restaurants. Free WiFi is accessible in all areas. The air-conditioned guestrooms are fitted with a work desk, tea/coffee making facilities and a TV with cable channels. The en suite bathroom has bathroom amenities and a hairdryer.